There are two types of people: those who eat breakfast, and those who don’t. Breakfast eaters, whether it’s a bowl of cereal or a gourmet omelette, love to start their day off with a boost of energy and hopefully some delicious food in their mouths! Some of those who skip this important meal will say that they just don’t have time, or food in the morning makes their stomach turn. At Tortilla Flats in Santa Fe, we are definitely breakfast lovers and we can’t wait to change non-breakfast eaters minds with authentic Mexican favorites including huevos rancheros and our famous breakfast burrito. Why Start Your Day With a Well-Balanced Meal? Boost your metabolism: Your body is in a fasting state in the morning, which means your metabolism is low. Getting some food into your stomach within one to two hours of waking up will kickstart your metabolic rate and will provide your body with necessary energy (and additional calorie burning). Curb cravings: If you have ever skipped breakfast in the morning, you are probably familiar with mid-morning hunger and cravings that come with it. Hunger doesn’t care about timing either, you may feel hunger pangs in the middle of an important meaning, leaving you with a loss of focus and needing any type of food. Easy to grab foods are commonly high-calorie, high-sugar foods that, while they fill you up, are not healthy choices. Help your muscles: When your body isn’t getting the calories it needs, it will pull energy from your muscles. If you’ve been working on toning your biceps or abs, help your body out with a high-protein breakfast. Energy boost: Breaking the fasting state that your body is in each morning will help you keep up your energy throughout the morning. Give your body a healthy dose of vitamins and minerals to prevent fatigue before lunchtime. What’s the Solution? Come to Tortilla Flats! 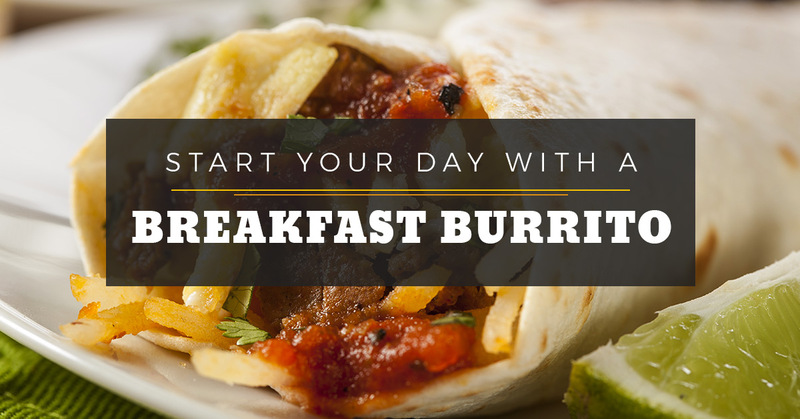 Our Santa Fe restaurant opens up bright and early at 7 a.m. so you can grab one of our breakfast burritos before heading to work. 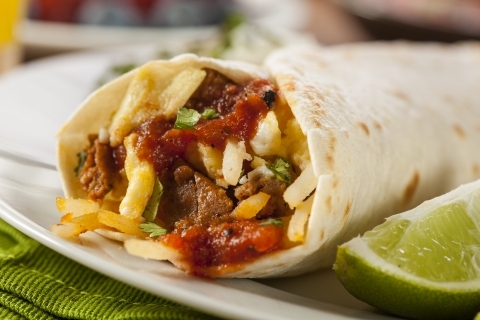 Our burrito is filled with scrambled eggs, choice of bacon, ham, or chorizo, and hash browns. And if you want an extra kick, smother your burrito with red or green chile (some have said that our green chile is the best they’ve ever tasted). If you have some extra time in the morning, or if you want a relaxing breakfast on the weekend, you can expect to find a variety of breakfast favorites. Huevos rancheros: Eggs, red or green chile, beans, cheese, served on a corn or flour tortilla. El Tamale: Eggs with one tamale covered in red or green chile, beans, and served with a corn or flour tortilla. Create your own omelette: Customize your breakfast by creating an omelette. Ingredients include mushrooms, onions, ham, bacon, peppers, broccoli, and more. Pork chops and eggs: To get your protein for the day, this eight-ounce pork chop will do the trick. It comes with eggs, hash browns, corn or flour tortilla, and toast or pancakes. When you’re in the mood to start your day off right, come to Tortilla Flats. Our breakfast menu has everything you could ever want.